GOLD MEDAL 2008 Austrian Wine Challenge, Vienna, Austria. 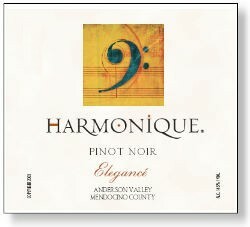 2005 marks the first year in which Harmonique offers a third bottling, Elegance', which we believe you will find a compelling addition to our library of Anderson Valley Pinot Noir. Harvested: October 1-4, 2005 The 2005 wines were aged in 70% new French oak barrels until the following summer. At that time the wines were racked from the barrels, blended and returned to the barrels to finish again - a total of 19 months in oak. The older vines produce a delicate, floral wine. The grapes for Elegance' come from Day Ranch, and Conzelman Vineyard, primarily from its 30-year old cordon pruned Martini clone vines.